The Lincoln Memorial was dedicated on Memorial Day—May 30, 1922. Years in the making, the planning and building of the Memorial would end with soldiers and civilians from all sides of the Civil War together for the dedication ceremony—joined in peace as Lincoln had wished and fought for decades before. The Senate Park Commission Plan, published in 1902, called for a Lincoln Memorial at the new Potomac River edge that would serve as the terminus of an expanded National Mall across the recently created West Potomac Park. In effect, this Lincoln Memorial would serve as a gateway, at the foot of a new Arlington Memorial Bridge, to the Capitol and the District of Columbia, and to an expanded park system (including Rock Creek Park). If the river was a dividing line between Union and Confederate spheres during the Civil War, the Memorial Bridge would link the Custis-Lee Mansion and Arlington National Cemetery with the Lincoln Memorial in a manner that symbolically might reinforce the national reconciliation and reunification that Lincoln had so nobly sought. In its own right, the proposed Memorial would elevate Lincoln through its simplicity, dignity, strength, and beauty in proportion and in classical form. The Commission would illuminate Lincoln’s character through sculpture and through his own eloquent speech inscribed within. Gaining Congressional approval of the Senate Park Commission Plan, and obtaining legislation to build the proposed Lincoln Memorial at the Potomac River edge was to take a decade amidst political challenges and the consideration of many other Lincoln Memorial concepts, including a Memorial Road from Gettysburg, Pennsylvania to the capital. To aid the process, Congress passed legislation in 1910 to create a U.S. Commission of Fine Arts. The Commission of Fine Arts mandate was to advise the government with regard to statues, fountains, and monuments on District of Columbia public sites. 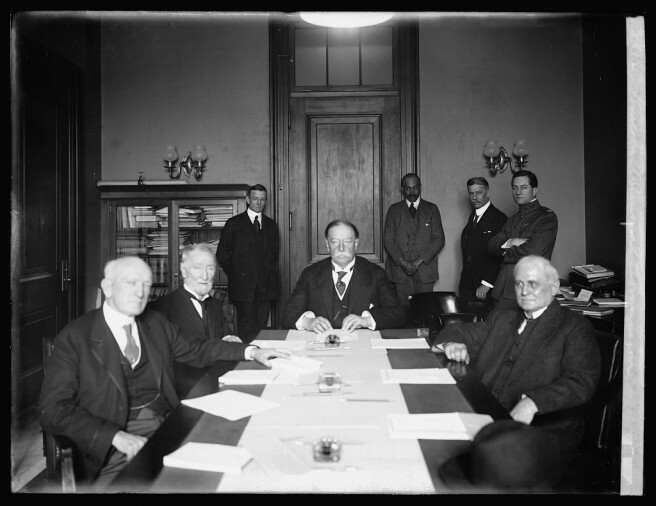 President William Howard Taft appointed the U.S. Commission of Fine Arts members, including former members of the Senate Park Commission. On February 9, 1911, Congress passed legislation to create a Lincoln Memorial Commission to advise on the location and construction of a new Lincoln Memorial. When the U.S. Commission of Fine Arts recommendations reinforced the Lincoln Memorial Commission published report on July 17, 1911, the Senate Park Commission backers finally had achieved the essential support necessary to build the Lincoln Memorial at the Potomac River edge. Be it enacted by the Senate and House of Representatives of the United States of America in Congress assembled, That William H. Taft, Shelby M. Cullom, Joseph G. Cannon, George Peabody Wetmore, Samuel Walker McCall, Hernando D. Money, and Champ Clark are hereby created a Commission, to be known as the Lincoln Memorial Commission, to procure and determine upon a location, plan, and design for a monument ot memoirial in the city of Washington, District of Columbia, to the memory of Abraham Lincoln, subject to the approval of Congress. . . .
Sixteen meetings of the Commission have been held. At the first meeting, on March 4, 1911, Hon. William H. Taft was chosen chairman of the Commission. At subsequent meetings Henry A. Vale was appointed secretary, and the Engineer officer in charge of public buildings and grounds was appointed executive and disbursing officer of the Commission. Both served without compensation. One of the members of the Commission, Hernando D. Money, died on September 18, 1912. As provided in the act creating the Commission, the President filled the vacancy by the appointment of Thomas S. Martin, of Virginia. Read the full Lincoln Memorial Commission Report for a behind-the-scenes account of what went into the development of the Memorial. 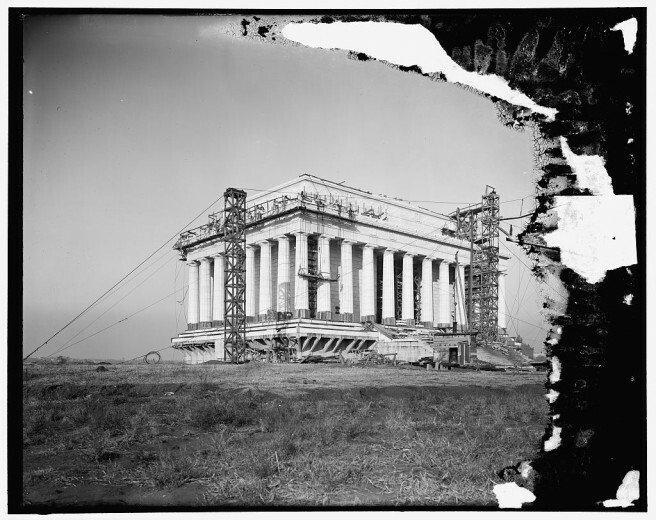 The National Parks Service has a fantastic display of the construction of the Lincoln Memorial via the online book A Memorial to Abraham Lincoln. Additional images from the drafting and construction process are featured below. Ex-President Taft, Speaker Champ Clark, former Senator Wetmore, Senator Martin, Joe Cannon, Ex-Senator Cullom, Col. Cosby, Superintendent Washington Parks, Henry Bacon, and H. Vale.